This handle back diner chair is upholstered in cracked ice vinyl. 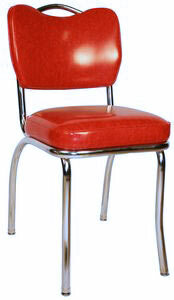 The Diner Chair pictured is upholstered in our famous Red Cracked Ice Vinyl. Cracked Ice Grey and Cracked Ice Yellow are also available. All three cracked ice colors are in stock and ready to ship. Cracked Ice Vinyl was very popular back in the 1950s. If you are looking for a 1950s diner chair, this is your chair.For more upholstery choices, see our "Diner Chair - Custom" section. Barstools and Chairs' hand upholstered diner chairs are strong and durable. With our 14 gauge steel frame, our diner chairs are the strongest in the industry. Diner chairs are perfect for restaurants, cafes, diners, and homes. They work for anyone trying to capture that retro 50s look. Our Diner Chairs are proudly made in the USA. Dims: 15.25" x 15.25" x 32"
This chair is in stock and ships in 2 business days.